It amazes me at the things builders do to save a few dollars. Now some of these things are so subtle you don't really notice them at first, then when you start to decorate, you just shake your head in dis-belief. Then I decided that I really wasn't sure about the white in the living room and thought I would try it in the family/breakfast rooms. Ok, back to the situation. 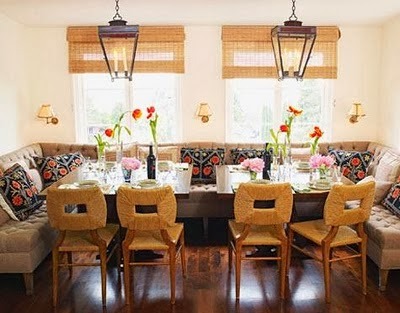 After thinking about this and looking at all sides of the situation, I think I am just going to eliminate all the drapes in the family/breakfast area and just do Bamboo Blinds. Now this is a look I really like, the blinds are hung really high and drapes on the sides. This would definitely work and I could use the white drapes for this look. However I love the clean lines of no drapes. I love how these are hung outside the window and hung high, that would work perfectly in my room. Here is a picture of my previous home where I just used the shades by themselves. I loved it and they were so easy to keep clean. (I know a totally different kind of room and really high vaulted ceilings.) I think if I hang the blinds above and outside the windows I can create this same really clean look. After searching for days, I looked at all kinds of blinds and still wasn't convinced that was the look I wanted, but I did find the perfect thing. I t hink this will be fabulous. So what do you think? Do you try different things, or do you stick with the statis-quo. Love the toffee check drapery, dear freind!!! I try new accessories, but usually stick with drapes for a l o n g time. (During our Military days, every move meant different drapes. . . The Bamboo shades are stunning! Would definitely hide the builders mistake. 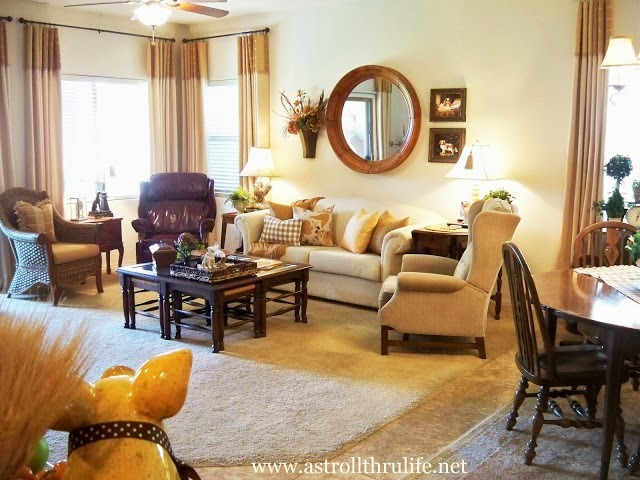 Your home is lovely. . .a reflection of you and your exquisite taste! Whichever you choose, it will be grand, indeed!!! Love the checked drapes, but also love bamboo blinds. It is fun going through this thought process with you. I wanted to use bamboo blinds in the home we are currently in but it was just not in the budget. Either looks is fantastic. I still have no idea why the builder put the window so high in my kitchen or smack dab in the corner in my office and Sweet Guy's room. Grrrrr. A while back Lowes had some that could be cut to size. I noticed them even though they don't go with my place, because they seemed nice for the price. 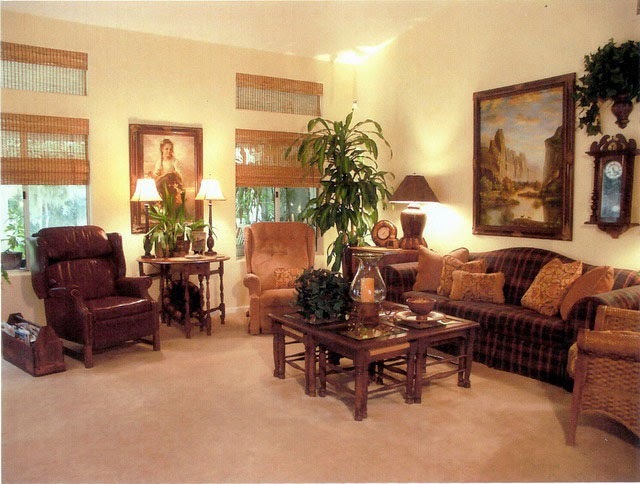 With the warm whites in your home, I'm thinking bamboo will work from the photos you provided. I'm always changing things up. Oh I love it…can't wait to see the entire room! Having to choose window treatments is the absolute bane of my existence (next to choosing paint colors). I think you have a well-thought -out solution and it will look great when you're done. I particularly liked the look with the bamboo shades and the white drapes. I love bamboo shades too, but I do love the buffalo check too! I love the check. I am in love with houndstooth and mixing this in with the Buffalo check fabric in the same color could look very good as pillows or even as the drapery. Love the checked drapes...neutral but great interest. I think the bamboo blinds are great...I have one in my kitchen above the sink...no curtain there...and I was thinking of adding some to the sewing room when I paint and re-do it...I have big white blinds and drapes in there now. Have a great day!! Will bamboo blinds be private enough at night and are they easy to pull up and down? Those checked drapes are going to be fabulous for your home. They will add so much interest. Can't wait to see them on the windows. Don't you hate indecision? I know I do! It drives me crazy. Good luck on whatever you do!! Window treatments are so expensive that I think almost everyone agonizes over their decisions. I know I do. I too have wood blinds but I have to say I like them and they don't get too dusty very often, but of course it's a different environment than yours. I really like the buffalo check, but I like the blinds too! Big help, I know :/. I dislike the wood blinds too...mine are always dusty no matter how many times I wipe them off. grr. I love the look of the bamboo blinds...and the buffalo check! Good luck with your decision. Marty you know I love buffalo check but I also love the bamboo blinds! Love seeing a photo of your old home the room looked so pretty! I love your rooms; I think the check with bamboo blinds would look fabulous. I have them downstairs to almost all my windows and they really look nice inside and from the outside. Hi Marty! Oh, I just love whatever you do and I'm loving the checked drapes. Could you use the blinds with those checked drapes? I know whatever you do, it'll be gorgeous! Hope you're doing well. Marty, those are really goodlooking. I think you can't go wrong with those curtains. They will be the perfect pop of that something something to make the room pop. Dropping by for Thrifty Things Friday! I love the bamboo blinds and the check drapes! Both would be wonderful choices. Thanks for linking to TTF! I love the mixed textures. Going to be very pretty Marty. I am pretty much status quo but only because of money. However..I DO know that the next change I make..it will NOT be the wood blinds I thought I wanted. It will be those very shades. They will look gorgeous! I still have those verticals..but not for long. That white drapes! 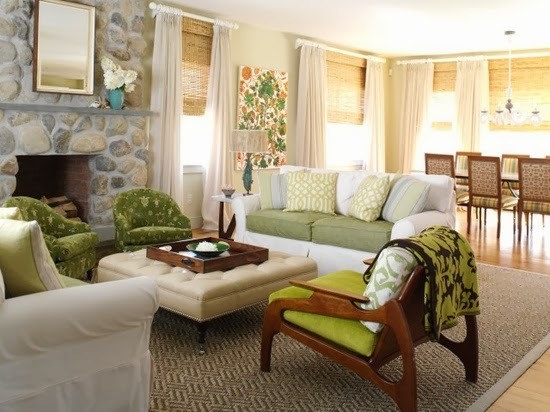 I adored the green chair, white couch and the stone fireplace. It’s a perfect place to live in, I already imagine how beautiful the exterior. Absolutely stunning! I do like the buffalo checked curtains and I like the bamboo too. Wondering if you are going to use them together. Oh please keep the buffalo check drapes! They look perfect! And bamboo blinds added would also look amazing. I definitely think your on the right track now...gorgeous friend! I am going thru the great window treatment dilemma as well Marty. Debating on wether we want to order blinds or not for the living room. I can not wait to see your new check curtains! Thanx for joining THT. I have the big chunky wood blinds and I love the look, but HATE to keep them clean. They are just dust magnets. I like the bamboo shade look in those photos. Anxious to see what you end up with! 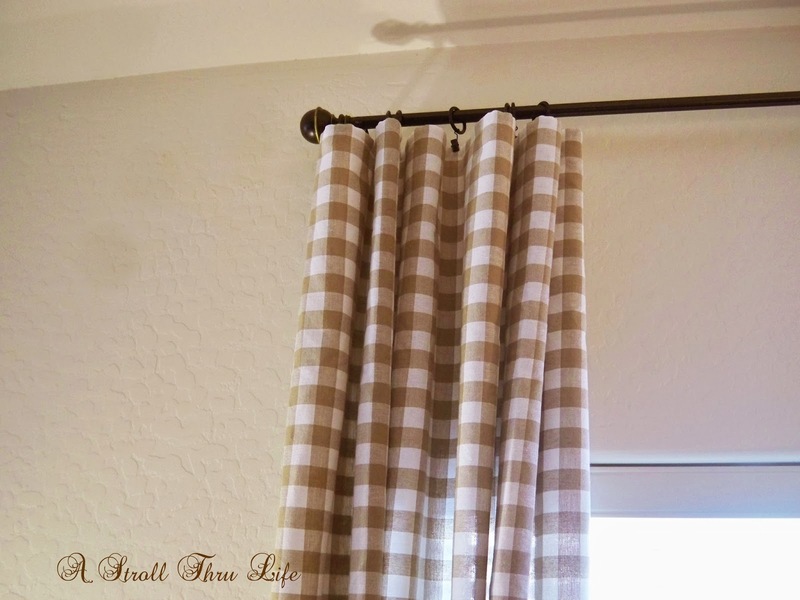 I love the idea of bamboo blinds-and the check curtains-I am in love with those! I have real high ceilings in my living room, however one window was oddly low in the room because of the front porch on the other side of the window. 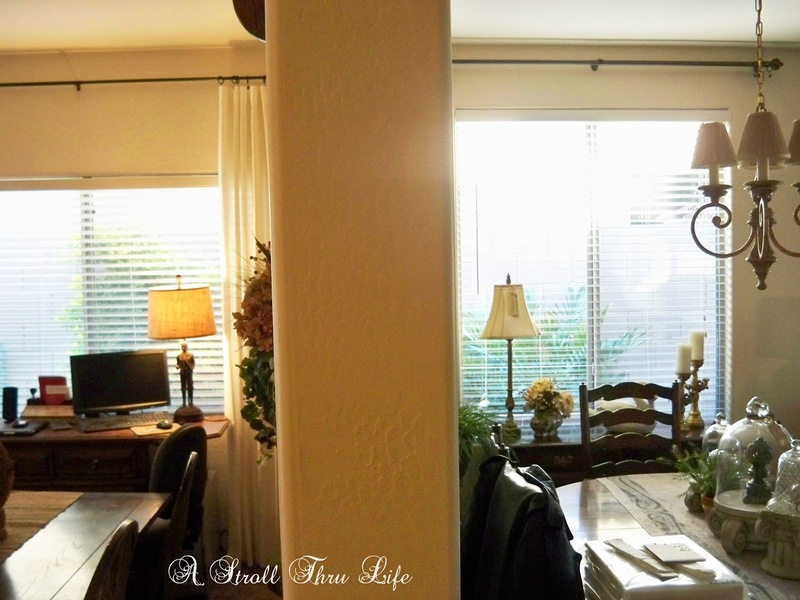 We took mirror tile squares and trimmed the with wood window molding and they really fool your eye into thinking they are just transom windows, and hung the drapes above the faux transoms and it made the windows in the room all even and worked out perfectly. I've lived in this house I had built nearly 24 years and until today, I never noticed, NEVER, that the width of the soffits on either side of the kitchen are not equal. The left hand side soffit (as I sit starting at the kitchen from the family room) is a good 5-6 inches wider than the soffit on the right hand side. RIDICULOUS! There is no reason for that at all, except sloppy building practices. The widths of the cabinets on either side of the stove do not match, either. Strips of filler were inserted and until a few years ago, I never really paid attention. I suppose if I hadn't started reading decorating and d-i-y blogs I never would have noticed, so it's sort of a curse in one respect, LOL! It's been driving me bonkers ever since that my cabinets are not equal widths on either side of the stove, which is front and center on the back wall of the kitchen. I cannot afford to replace the cabinets and they don't NEED to be replaced, they are in excellent shape and not out of style. They are white melamine Euro-style cabinets, as fresh looking today as they were 24 years ago. Except for those different widths... Oh, and the installers did the same thing with the bottom run of cabinets. LOL! So the mis-match matches top and bottom. Wish there were some blinds I could put up to just make it all disappear. Marty, any ideas???? Oy! The blinds will be great.